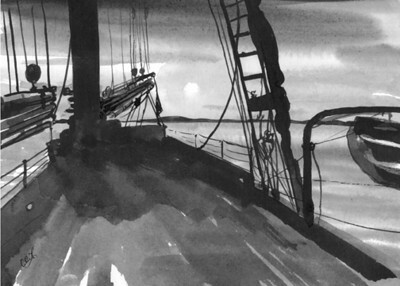 This painting was born from a sailing excursion on an 1871 schooner near Camden, Maine. Setting sail on this historic tallship meant being part of the crew along with three dear friends and a handful of other brave souls. We raised the sails, brought up the anchor, peeled pounds and pounds of potatoes ! A kayak was brought along with us to Maine which we had the chance to launch from the ship. We paddled to shore to enjoy a lobster and corn beach party. The best part of the trip were the calm seas, wonderful peace and quiet and just sitting on deck imagining what it was like over a hundred years ago on this very boat.